On arrival at Chennai Airport/Railway station, our representative will welcome you and transfer to the hotel. Check in on arrival and relax. In the afternoon set out for a half day sightseeing of Chennai. Today you will see Government Museum, Fort St. George, Fort Museum, St. Mary’s Church, Santhome Cathedral, Kapaleeswara Temple and drive past Marina Beach. Later return to your hotel. Overnight stay at the hotel. In the morning check out from the hotel and drive to Tirupati for Darshan of Lord Balaji. 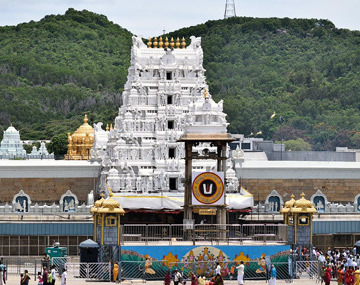 The temple town is renowned for the ancient temple of Lord Venkateswara (Lord of seven hills or Balaji, as he is affectionately known) which is situated atop 860 mts high Tirumala hills. Apart from being one of the oldest and most revered temples in India, it also holds the distinction of being one of the richest temples in the country. The story goes like this. Once Lord Venkateswara borrowed money from the divine treasurer Kubera to meet his wedding expenses. He is still paying back to him and it is why the devotees donate generously to the temple coffers. Overnight stay in Tirupati. Post breakfast drive to Tiruchanoor, also referred as the Alamelumangapuram, where the temple of Sri Padmavathi Devi, the consort of Lord Sri Venkateswara is situated. As per common beliefs, no trip of Tirumala is said to be complete unless you visit Padmavathy Devi Temple. After visiting the temple, drive to Chennai Airport/ Railway Station to board a flight/ train to an onward destination. A famous temple town in the Indian state of Andhra Pradesh, Tirupati is highly popular among devotees from India and abroad. They come in hordes to seek blessings of Lord Venkateswara also called as Lord Balaji. Most of the travelers and pilgrims plan a trip to Tirupati, with Chennai as a base. Great air connectivity, world-class hotels, scrumptious culinary delights and presence of several tourist attractions inspire vacationers/pilgrims to plan Tirupati tour package from Chennai. So imagine exploring beaches and magnificent architecture in Chennai and seeking blessings of Lord Balaji as part of a single vacation. A prominent travel agent in India with a great experience in religious tourism. We, at BookOtrip have everything to make your religious trip a hassle-free experience. With tie-ups with major hotel properties, car rentals and several other services we are well equipped to offer excellent travel arrangements for your Tirupati tour from Chennai. This (2 Nights / 3 Days) package covers major tourist attractions in Chennai and Tirupati and Darshans to Lord Balaji. Bookings with incorrect age of passenger/passengers may lead to penalty at a later stage. Supplementary cost will be applicable if the travel date is during national holidays, festivals, long weekends etc.